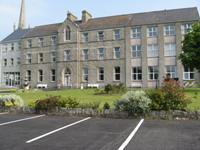 Teach Bhride is a holistic education centre set in Tullow, Co Carlow. Teach Bhride supports people in their desire to live full and meaningful lives in harmony with themselves, with others and with Earth. The centre is committed to the development of the whole person, integrating body, mind, spirit and feelings, and providing opportunities for people to grow and find meaning in a way that is appropriate to the uniqueness of each person. Adopting an inclusive policy, Teach Bhride welcomes all to participate in their courses and services regardless of ability to pay. We strive to reflect an attitude of compassion and respect for the struggles that are an inevitable part of each of our lives.